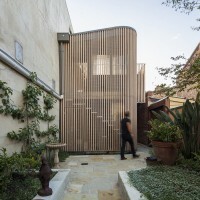 Tim Spicer Architects have designed the Little Gore Street Studio in Fitzroy, Victoria, Australia. 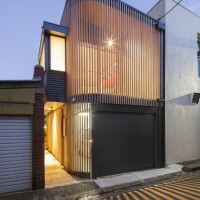 Located in a tight lane way in Fitzroy, Tim Spicer Architects have created a truly unique response to urban densification. 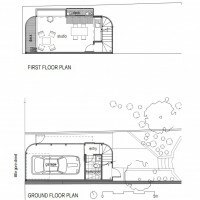 The new two-story building replaces an existing dilapidated garage and houses a carport and bathroom at ground floor, with home studio above. 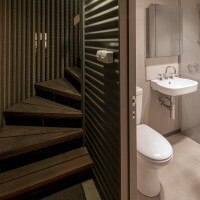 Central to the design are sustainable principles, which govern both the design response and material selection. The client had previously owned a timber furniture company so it was natural that timber was to be the major element in the building. An ethereal skin is created through the application of vertical timber battens that are screw fixed to three curved laminated timber beams. These laminated compound beams curve in two directions wrapping around the building facade, vertically twisting at roof level to create a raking ceiling. 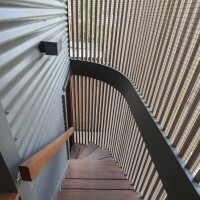 The open skin created by the local recycled yellow stringy bark battens blurs the distinction between the internal and external, resulting in a permeable privacy screen. 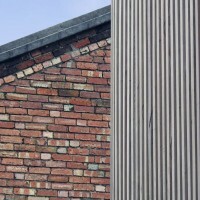 The repetition of the battens creates a unified façade; the oil based finished ensuring its longevity and highlighting the natural appearance of the timber. 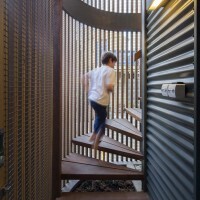 An open timber stair made from recycled brush box floats delicately between the inner walls and the external timber skin of the building, connecting the inhabitant to the garden as they move between floors. The timber theme continues throughout the building interior with bamboo floors providing a warm and hard wearing working surface. 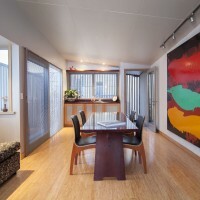 The studio bench tops and cupboard faces are made from recycled red gum and the ceiling is clad with geometric faceted plywood, each panel accentuated with recessed shadow lines. The skin is integral to the passive design principals of the building, enabling the building to breath and providing abundant natural light. The roof structure cantilever’s over glazing to protect the inner spaces from the harsh summer sun but allows for dappled light through its battened exterior during winter. Victorian Ash double-glazed sliding doors and windows on the second story create fresh-air cross-ventilation paths throughout the level. Water is harvested from the roof and stored in a 5000-liter water tank, which supports the lush garden, providing the perfect setting for this unique building. 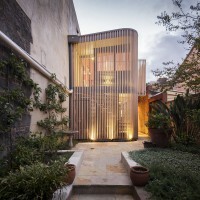 The thoughtful design and use of natural materials resulted in Tim Spicer Architects winning the Small Budget Projects category of the Australian Timber Design Awards in 2012. 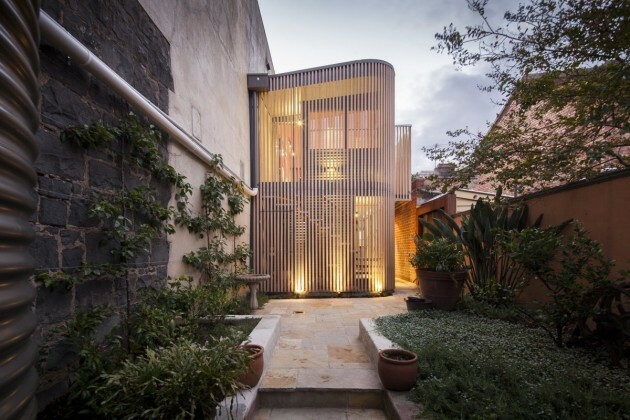 The practice has a history of designing high quality residential and multi-residential buildings, providing clever solutions for challenging sites.